©1991 Paramount Pictures. All rights reserved. 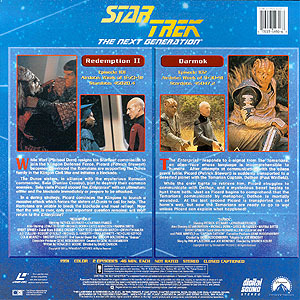 While Worf (Michael Dorn) resigns his Starfleet commission to join the Klingon Defense Force, Picard (Patrick Stewart) becomes convinced the Romulans are supporting the Duras family in the Klingon Civil War and initiates a blockade. The Duras sisters, in alliance with the mysterious Romulan commander, Sela (Denise Crosby), plot to destroy their common enemies. Sela visits Picard aboard the Enterprise with an ultimatum: either end the blockade immediately or prepare to be attacked. In a daring strategy, Picard convinces the Klingons to launch a massive attack which forces the sisters of Duras to call for help. The Romulans are unable to break the blockade and must retreat. Now that the war is over, only one important question remains: will Worf return to the Enterprise? The Enterprise responds to a signal from the Tamarians, an alien race whose language is incomprehensible to humans. 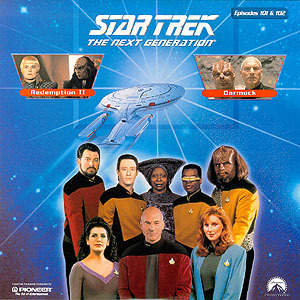 After attempts at communication with the aliens prove futile, Picard (Patrick Stewart) is suddenly transported to a deserted planet with the Tamarian Captain, Dathon (Paul Winfield). While the crew fights to retrieve him, Picard struggles to communicate with Dathon, and a mysterious beast begins to hunt them both. Just as Picard begins to comprehend that the Tamarians communicate by metaphor, Dathon is mortally wounded. At the last second Picard is transported out of harm's way, but now the Tamarians are ready to go to war unless Picard can explain what happened!